The DEWALT DW618 2-1/4 HP Electronic Variable-Speed Fixed-Base Router is an ideal choice for me as well as those who likes doing their DIY home improvement projects. It comes equipped with features that make the job easier. We came up with this guide and review with the hope of helping you to make a good purchasing decision after reading this. I am fond of woodworking and particularly focuses on DIY projects. Rather than paying somebody to do a job for me, such as improving the fixtures of my home, I take the time to learn the skill save at the same time. I started with this passion when I was a teenager, but never focused on it. Back in the days, manual routers were a thing. These days, however, I consider it both convenient and more effective to use a power router which offers better accuracy and precision in cutting wood pieces and bits. 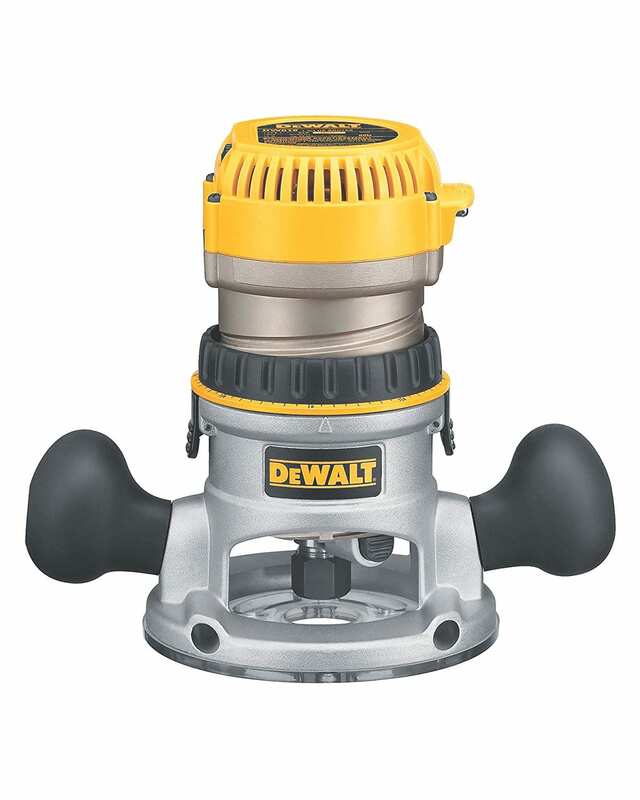 As there are several options available these days, I wished I knew about the existence of DEWALT DW618 2-1/4 HP Electronic Variable-Speed Fixed-Base Router when I first purchased a power router for myself. This machine comes with features that make it a high quality choice. Power routers are ideal for individuals like me who are into woodworking, and wants to see precision beyond compare in their final output. While manual routers are good for those who have the skill, power routers are more efficient for those like me who is still working my way with this trade. This fixed base router from DEWALT is beginner friendly, and is equipped with features that make it easier to use, despite being a complicated tool. With the DEWALT brand to back up its name, there is also a guarantee to quality. Routers are highly portable tools. They are designed to be handled for different purposes. As an alternative, they can also be mounted on top of a router table in order to complete more intricate jobs too. The older versions of these wood routers are powered manually. However, with the advancements in technology, electric power has turned these items into multi-purpose tools. As such, most woodworkers prefer routers that are electric driven compared to the manual ones as they can complete tasks within minutes. This tool is highly diversified. In fact, with just a single machine, you can already create moldings, ornamental edges, crave hoardings, mortise, cut grooves, and many more. When secured on top of a huge mounting table, you can work with bigger wood pieces easily. These power wood routers can also manage precision and accuracy in terms of height and depth, thus reproducing work pieces that are easy and perfect through these machines. This is one obvious advantage offered by a power machine compared to a manually operated one. If this is the first time that you will purchase a router, selecting the best one can be described as ‘bewildering’. Before finding yourself lost amidst a sea of prices, sizes and features, one thing that you need to consider first are your needs. What do you want your router to accomplish? Focus on the function, being realistic with your skills as well. In routing, a bigger size of machine is not necessarily better all the time. This is particularly true if you are planning to use your router as a handheld tool compared to placing it under a table. A full sized machine is needed for joint making and profiling. However, if you are working on more delicate tasks, smaller ones are generally ideal. With this feature, you just twist the dial in a single way and it does what you want it to do, regardless of the bit that you have to use. Without it, any router may give a full speed after turning on. The sound can be quite startling, and the power surge may make the unit jerk. This means that the circuitry works in monitoring the load that is placed on the motor, adjusting to match the torque output. This means that even though you are working on a heavy cut, the motor will not stall or labor at all. The DEWALT DW618 2-1/4 HP Electronic Variable-Speed Fixed-Base Router is among the bestselling options out there. It comes with added features, despite being categorized as a mid-range wood router. It offers an interesting combination of convenience and power, making it a good option for a professional wood worker, and those who use it at home for DIY projects. While the standard features that are built into this power router make it very easy to use for beginners and hobbyists, the additional features are advanced, allowing it advanced wood workers to add this one to their kit. Aside from being handheld, it can also be mounted on a router table. This wood router comes with an electronic variable speed and a full feedback control, going from 8,000 and 24,000 RPM. The speed can be adjusted by simply turning the dial, allowing you to have better control of the tool, especially when it comes to determining the suitable speed for your project. This router comes with a soft start that helps in minimizing motor torque. A soft starter is a tool that is often used with most AC electric motors in order to reduce temporarily the load on the train, as well as the electrical current surge at start up. As such, stress is reduced on the motor. The DEWALT DW618 router offers a fixed base feature. This means that it comes with a locking lever, alongside a 360 micro adjustment ring which easily raises the router both up and down, achieving the ideal depth of cuts each time. This router comes with two rubber handles, further adding to the ergonomics of its design. The motor of this router comes equipped with a cut out channel located on the back side, making it easy to line it up with locking needles on the base of the plunge. This offers the capability of having the power cord and the power switch either on the right or the left hand side. A smart buyer examines all options first. Before making a final purchase, I made sure to check all options available, educating myself everything about this power router. As such, I have browsed through different reviews from others who have already tried using the machine. Most of the reviews are positive about this model. There are hundreds of customer reviews for this particular product and all of them a very high rating. One customer said that he was hesitant at first because of some reviews he had read about this product. He loves the cut produced by this tool, and the fact that it felt very secure and safe. Another customer mentioned that this machine is “well made and designed”. He mentioned that the size and the price were just right. The speed control of this machine is also quite easy to use, making it even safer compared to his older routers that does not have a soft start feature. There are some negative feedback as well, which is expected out of any product item. For example, one customer pointed out that the ‘bit changing is cumbersome’. While there is a spindle lock built in with this model, it has a spring loaded button which needs to be held while turning the wrench using your other hand. The Bosch 1617EVSPK router comes with an electronic variable speed plunge, as well as a fixed based router kit. It also has a soft start, which means that the tool will not jerk during start up. Construction wise, it is made of aluminum, with wooden handles on the fixed base, as well as a soft-grip handle for the plunge base. The Black & Decker RP250 plunge router is the ideal tool for decorative cutting from the middle of the material. With its 10 amp motor, this model offers superior power when cutting. It operates with gradual start function, allowing for better control and more precise output. The PORTER-CABLE 690LR fixed base router uses a hefty motor in order to generate precision in cutting. It comes with 2 ergonomic handles which are placed strategically in order to make the process of routing more comfortable and easier, even when working on an all-day job. For more convenience, this router also includes some collets which works on smaller shank bits. This model is a variable speed and palm grip combo, with amazing features such as quick-locking systems and soft-start feature. It is also constructed using aluminum, and equipped with soft-grip handles for convenience. What makes it standout from others is that it is designed with user friendly features, with its simple and straightforward operation. The SKIL 1830 router is an ideal option if you are dealing with advanced home improvement tasks and projects. It is equipped with both a plunge and a fixed base, thus allowing you to choose your method preferred for routing, according to the project you are working on. It has a micro-fine depth adjustment which allows for more precise cuts. Instead of directly going to a professional woodworker to do your home improvement projects, having your own wood router is a good choice to take into consideration. In my case, it allows me to improve on my skills, while I also learn new things about this trade while working on personal projects. All in all, the DEWALT DW618 model of electronic variable speed fixed base router is a very promising option. It comes with different features that does not just offer the basic things expected out of it, but also additional ones that make your task even more convenient and easy. With its aluminum construction, there is a guarantee to longevity, even though you may be planning to use it frequently on various projects. At a very attractive price, you surely have a tool that offers value for your money.